Happy Friday! First of all, I have to say, I love this dress. I always love a classic black and white look, but this dress is perfect. It has the perfect amount of detail and is so fun to wear! I wore this outfit to a friend's bridal shower last weekend and had to end up wearing tights because it was snow flurrying (yuck!). We've been having awful weather. I'm so ready for warmer weather. These Loren Hope earrings are my favorite piece from my latest Rocksbox. They are so gorgeous. I know I will end up buying them, because I can't imagine sending them back. Don't forget you can get a month free of Rockbox with code 'sreichelxoxo'! It is so fun to get jewels delivered to your door once a month. I highly recommend trying it free for a month! You can always cancel with no charge. 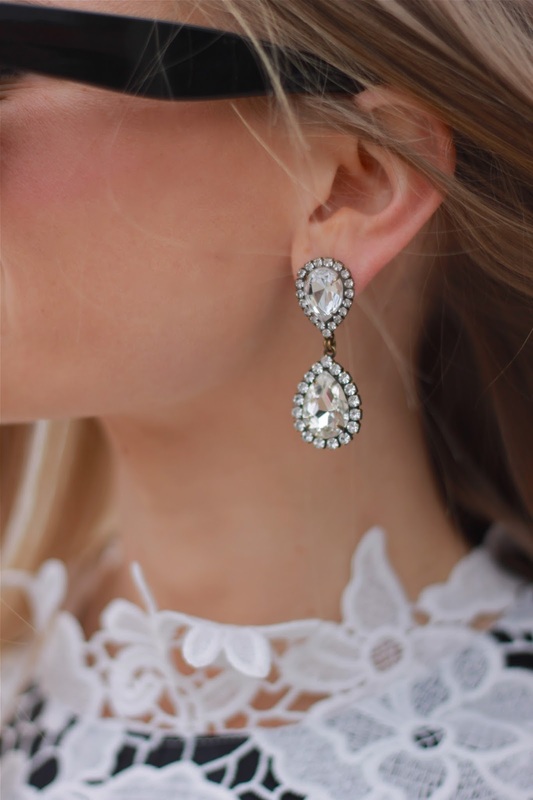 Who doesn't love playing dress up with adorable jewels?! Lastly, today is the due date of my new niece! So far, there are no signs of baby (my mom thinks my sister won't go into labor until next week). I am so anxious and excited to meet the little princess! My parents and I will be off to Philly as soon as she arrives!